We’d love your help. Let us know what’s wrong with this preview of A Simple Game by Kirk Wolcott. Global terrorism and international sports collide in this riveting debut novel by American diplomat and former sportswriter Kirk Wolcott, prompting a crucial question for our time: How far is too far when trying to change the world? When three of the world’s top athletes are slaughtered on the same night in Hong Kong, Amsterdam, and Beverly Hills, celebrated peace and confl Global terrorism and international sports collide in this riveting debut novel by American diplomat and former sportswriter Kirk Wolcott, prompting a crucial question for our time: How far is too far when trying to change the world? As the world shudders over the attacks, a group of young terrorists gathers in the hills over Sarajevo to choose its next victim, while Crandall starts piecing together clues. Racing from the power centers of Europe and America to an African jungle to an Asian island on the brink of civil war, Crandall encounters mercenaries, warlords, and other waste products of world conflict, while falling for a beguiling human rights activist with a curious interest in his mission. With each new murder, the terrorists raise the stakes in a bold effort to hold the world hostage to their demands. But who are these extremists? What do they want? And is it possible the end to their bloody game somehow justifies the means? To ask other readers questions about A Simple Game, please sign up. Kirk Wolcott is a former journalist and conflict resolution adviser who now serves as an American diplomat. Born in Highland Park, Illinois, he grew up in and around Seattle and has spent much of his life crisscrossing the globe. A Simple Game is his first novel. After launching his career as an award-winning sportswriter, editor, and columnist in Southern California and North Carolina, Kirk heade Kirk Wolcott is a former journalist and conflict resolution adviser who now serves as an American diplomat. Born in Highland Park, Illinois, he grew up in and around Seattle and has spent much of his life crisscrossing the globe. 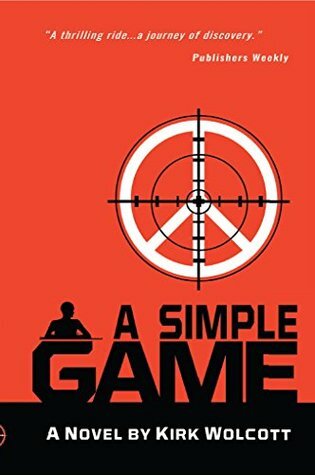 A Simple Game is his first novel. After launching his career as an award-winning sportswriter, editor, and columnist in Southern California and North Carolina, Kirk headed for farther shores. Work as a peace and conflict resolution officer at The Carter Center, former President Jimmy Carter’s nongovernmental organization in Atlanta, sent him to such hotspots as Bosnia, East Timor during its violent referendum for independence, Liberia, Nigeria, and Zimbabwe. For the past 15 years, he has served as an American diplomat in Kuwait, Sarajevo, Tunis, Kabul, NATO Headquarters in Brussels, and Washington, DC. Kirk lives and works now in Istanbul with his wife, Vonda, and their two intrepid cats.